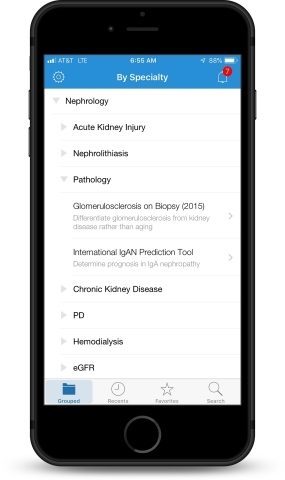 QxMD Software Inc., a digital learning technology company that makes it easier for healthcare professionals (HCPs) to discover and apply the latest evidence for use in clinical practice, today announced the availability of its newest point-of-care clinical tool ‘International IgA Nephropathy Prediction Tool’ for Calculate by QxMD mobile and web app users. Coinciding with the JAMA Internal Medicine e-publication of the paper ‘Evaluating a New International Risk-Prediction Tool in IgA Nephropathy’ by Sean J. Barbour, MD, MSc, Rosanna Coppo, MD, FERA, Hong Zhang, MD, PhD, and others, the Internal IgAN Prediction Tool becomes the fourth Calculate by QxMD tool to simultaneously publish with a peer-reviewed paper or presentation since October 2018. The tool was also timed to go live at the moment Dr Barbour presented at the 2019 ISN World Congress of Nephrology in Melbourne. QxMD™ is a digital learning technology company that makes it easier for healthcare professionals (HCPs) to discover the latest evidence and decision support tools for use in clinical practice. The company’s HCP engagement platform comprises a library of trusted apps that provide millions of members with fast access to full-text research, continuing medical education (CME), and up-to-date tools that drive disease recognition and therapy optimization. Powered by a sophisticated personalization engine, the platform aggregates PubMed feeds, journal table of contents (TOCs), 450+ diagnostic tools, micro-CME courses & more. QxMD also serves other healthcare constituents such as hospitals, libraries, scholarly publishers, and nearly 50% of the world’s top-25 pharmaceutical companies.